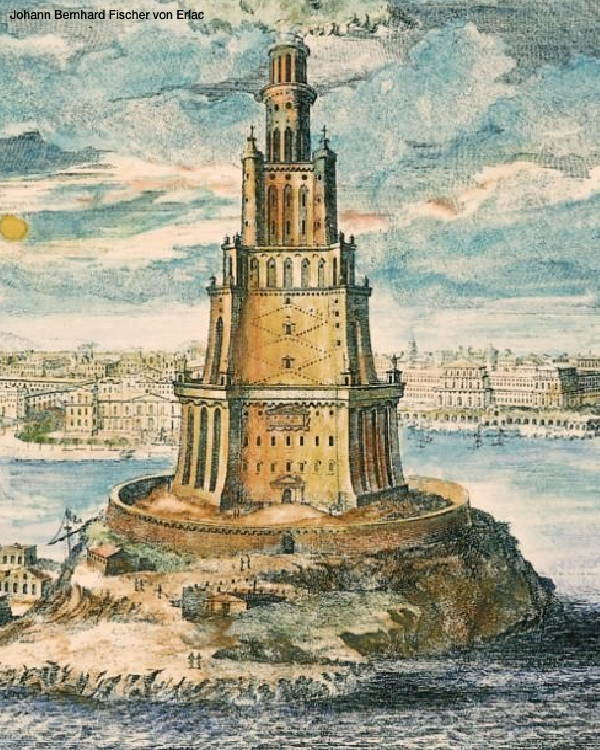 Pharos of Alexandria was the most famous lighthouse in antiquity and one of the Seven Wonders of the Ancient World. Built in the 3rd century B.C. 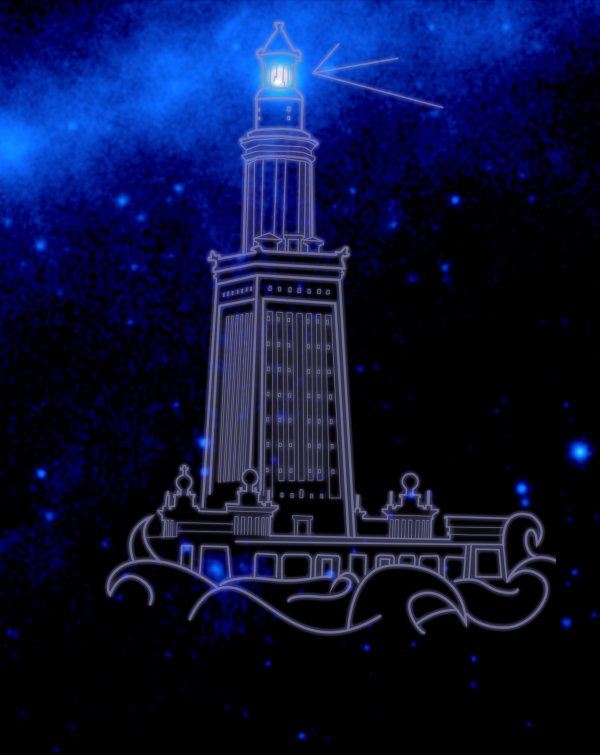 on the eastern tip of its namesake, the island of Pharos in the harbor of Alexandria, Egypt, the lighthouse served as a navigational aid for mariners approaching the port. It's said the tower stood more than 350 feet (110 meters) tall, and the lighthouse was used until the 1300s, when it collapsed during an earthquake. In 1994, underwater archaeologists located some of its remains. The gamma-ray equivalent of a lighthouse is a pulsar. 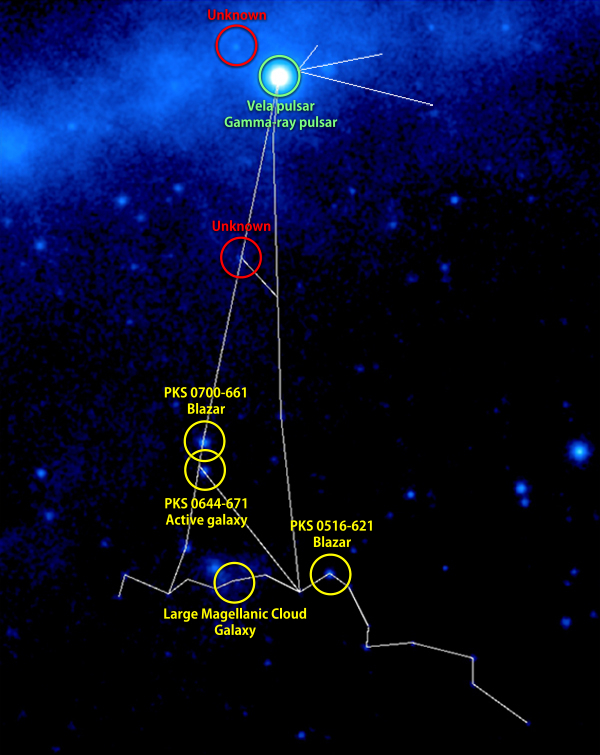 The Vela pulsar, the beacon of this constellation, is the brightest steady source of gamma rays in the sky. Pulsars are rapidly rotating objects that beams of energy in many forms, from radio to gamma rays. When these beams swing in our direction, astronomers detect a pulse in much that same way as we see the flash from a modern lighthouse. Vela spins 11 times a second or 660 revolutions per minute, which is faster than a helicopter rotor — and comparatively slow for pulsars. Pulsars are by far the most common type of gamma-ray source within our galaxy, but only a handful were known prior to the launch of Fermi. Now more than 200 are known, including the first gamma-ray pulsar found in another galaxy, the Large Magellanic Cloud, a satellite of our own Milky Way galaxy. The slowest pulsars may spin once every few seconds, but the fastest known rotates more than 700 times a second. They also possess powerful magnetic fields which, combined with their rapid spin, generates intense electrical fields. It's these fields that are ultimately responsible for the radio waves, X-rays and gamma rays we see. The physical object at the heart of a pulsar is a tiny, superdense stellar remnant called a neutron star. Only about 12 miles (20 kilometers) across yet more massive than half a million Earths, a neutron star is the crushed core of a massive star that collapsed and exploded as a supernova, an event that occurs about once a century on average in our galaxy. A supernova explosion blows the outer parts of the star into space, dispersing the chemical elements forged within it. These chemicals form dust that mixes with the interstellar gas that forms new stars and planets, just as chemicals from earlier supernovas found their way into the Sun, Earth and people.